With the highly anticipated opening of Neptune restaurant later this month, we thought we’d have a look at some other must-visit restaurants that have strengthened their links with the capital by using Dot London web addresses. From the Basque Country to Japanese, from Turkish to Italian, there’s an eclectic collection of tastes to choose from that best fits London’s global reputation as being a culturally diverse city. Based in Russell Square’s newly refurbished The Principal London hotel, Neptune is a modern seafood-focused restaurant in the heart of Bloomsbury and is run by the team behind Hackney’s seafood gastropub, The Richmond. Boasting top-quality British sourced produce, complemented with specially curated wines, it is set to be the place be this summer. As seen on the BBC’s recent Series of MasterChef, Eneko Basque Kitchen & Bar brings the taste of the Basque Coutry to Covent Garden. Serving a modern take on traditional Basque dishes in a relaxed and informal setting, the restaurant is a new departure from the three-Michelin-starred chef Eneko Atxa. While enjoying these delectable dishes you can enjoy some of the carefully crafted all-Spanish wine list exclusive to the restaurant. Set within the heart of Picadilly, Engawa is an authentic Japanese restaurant specialising in the delicacy of Kobe beef alongside a stunning selection of fresh sushi and sashimi. Based within the prestigious Ham Yard Hotel, this intimate eaterie is the flagship restaurant outside of Japan for the Salt Group who are considered to be a market leader in the Japanese dining scene. What started as a pop-up in Farringdon has become a fully-blown Soho restaurant. Freakscene is the latest restaurant to be opened by celebrated chef Scott Hallsworth, former head chef of Nobu, who has used his Asian cuisine know-how to create this new informal eaterie that delights its diners with delectable curious Asian plates. Marcella brings the taste of Italian cuisine to South East London’s Deptford, which is rapidly becoming the newest hot spot for the capital’s culture vultures. With its warm and welcoming atmosphere, you can immerse yourself in simple and delicious seasonal dishes, quaffed down with tasty Italian wine. 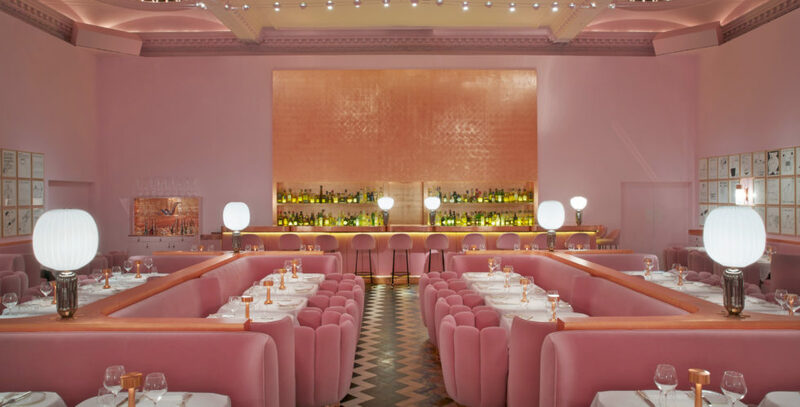 This Mayfair stalwart is a dining experience that pleases all of the senses, serving Michelin-starred food in breathtaking surroundings (see photo above, sourced @sketchlondon). Conceived by French master chef Pierre Gagnaire and restaurateur Mourad Mazouz, sketch is an Instagrammers heaven – not only does the food look like a piece of art, diners are also surrounded by extraordinary pieces of art. If you’re looking for somewhere fabulous to go, sketch is the place for you. Based in Marylebone, Yosma is a Turkish meyhane (tavern), mangal (grill) and raki bar inspired by the street of Istanbul. Their food philosophy is simple – choose ingredients from producers who are passionate about their produce. Their fish comes fresh from day boats off Cornwall and whole lambs from local suppliers. They lovingly showcase the depth, character and history of Anatolian food and drink, sharing the fascinating stories behind one of the world’s most prominent cuisines.